Metroparks Events Calendar 2019 – Kids fun and family-friendly events for Stony Creek, Kensington, Lake St Clair, and ALL of the HCMA Metroparks. Nature walks, fireworks, hayrides, sleighrides, seasonal celebrations, and MUCH more! Oakland County Moms highlights special events from the Metroparks events calendar to bring you the latest news and info on special events happening at the 13 Metro Detroit area Huron-Clinton Metroparks. Call to confirm costs when pre-registering for events. A Metroparks vehicle entry permit is required for these events. Daily & Annual vehicle permits are on sale NOW. You can pick one up at metroparks.com OR visit your local Metropark today. Meet the Easter Bunny, make an Easter craft and more. Ages 1-10. The Egg Scramble will be grouped by age. To register, please call 586-781-9113. Cost is $6 per child. Crafts, games, candy and an Easter Egg Scramble. Maybe even a visit from the Easter Pig… that’s right the Easter Pig. Preregistration required, 734-782-3956. $5 per child. Older kids will love the extra challenge of this special nighttime egg hunt. Thousands of eggs are scattered on our large field, but when the sun goes down, the eggs are harder to find. Bring a flashlight and hunt carefully for eggs filled with toys and candy. This event has one scramble time and age group. Collection bags are provided and glow-in the-dark bracelets are provided to each registered participant. Ages 8 and older. Check-in begins at 8p Metropark closes at 10p. Please preregister, 734-426-8211. $5. Bring the kids to scramble in our field of 4000 goody-filled eggs. This Eastertime tradition at Hudson Mills Metropark also includes visits with live barnyard animals such as donkeys, goats, baby sheep, and ducks. Also enjoy face-painting and visits with strolling costumed characters and the Easter Bunny. Be sure to bring your camera. Candy and toy prizes. Fields and scramble times are separated into age groups. Early arrival recommended. Activities begin at noon, scramble starts at 1p. Ages 10 and younger. Please preregister, 734-426-8211. $5. Time to have an egg scramble and meet the Easter Bunny. This event is smaller than the park’s large egg hunt and is meant for ages 4 and younger. Early arrival is highly recommended. No preregistration required. Cost is $5. No preregistration required. $5. Cash Only. Discover why the Native Americans referred to this full moon as the “Pink Moon,” as well as learning some facts, myths and legends surrounding our moon. Please preregister, 734-782-3956. $4 child, $6 adult. Help get the farm grounds cleaned up for the upcoming summer season. Numerous tasks will need to be done outdoors. Bring rakes, gloves, garden tools, sunscreen and a smile. Lunch and a free wagon ride will be provided for all participants. Please preregister, 586-752-5932. This is a FREE event. A Metro parks vehicle entry permit is required for these events. Egg hunts, crafts, and games. Sign up in advance and get ready for some fun. Please preregister, 734-379-5020. $5 per child. Bring the kids for an Easter Egg scramble and pet some of your favorite farm animals. Kids will also get the opportunity to have their photo with the Easter Bunny. Early arrival is highly recommended! No preregistration required. $5. Cash Only. Litter, such as fishing line and plastic bags, is dangerous for wildlife and unsightly to park visitors. Help keep the park beautiful, and safe for people and wildlife. Check in first thing in the morning for area assignment, then meet us back at the Activity Center for lunch. Please preregister by calling the nature center at 586-463-4332. FREE. Check in first thing in the morning for area assignment. Individuals, families and groups welcome. Free daily park entry as a volunteer. Snacks and water provided. Scouts can earn a fun patch. All ages – under 12 must be accompanied by an adult. Preregistration required. FREE. Walk the Woodland Trail, looking for spring beauties, trilliums, trout lilies, wood anemone, early meadow rue and more. Wear sturdy walking shoes and dress for the weather. Expect to walk about one-mile, on level gravel paths. Please preregister, 248-625-7280. $3 child / $5 adult. Springtime is amphibian migration time. Hike to the Vernal Pond in search of the many frog species and salamanders that travel to the pond to mate and lay their eggs. Ages 7 and up. Please preregister, 586-781-9113. $5. Each child will get to craft a one-of-a-kind nature-themed gift moms are sure to love. No preregistration needed, just drop in to the Nature Center to get ready for mom’s special day. Fun for kids of all ages. $5 per child. Climb aboard our wagon for a ride to view and learn the early wildflowers of spring. Share interesting vignettes about these plants, their pollinators, and how to use wildflowers successfully in native gardens. Ages 7 and up. Please preregister, 586-781-9113. $5. Celebrate Mom with a Hudson Mills Metropark tradition. Enjoy a fabulous brunch and then go for a guided stroll along our nature trail to discover all the wild spring blooms. This event is a beautiful way to spend a special day with Mom. Please preregister, 734-426-8211. $12 Adults / $9 Children. Treat your mom to a guided hike at Lake Erie Metropark & learn the stories, myths and strange facts behind some of the most beautiful spring wildflowers. Please preregister, 734-379-5020. $3 Child / $5 Adults / Mom’s FREE. Treat your mom to a guided hike at Oakwoods Metropark & learn the stories, myths and strange facts behind some of our most beautiful spring wildflowers. Please preregister, 734-782-3956. $3 child / $5 adult / Mom’s FREE. Bring your Mom or Grandmother out for a spring hike on the trails. Many of our visitors have been walking their Mom’s each year for over 25 years. It’s time to start your own family tradition. Participants will receive a certificate and all Moms and Grandmothers will receive a flower to plant in their garden. Wear comfortable shoes and bring a camera. This is a FREE event. Moms get a free ride today when they take their children on the hayride , as a thank you to those that work very hard and still have time to come with their kids for a fun afternoon at the farm. Mothers Free, standard hayride rates apply to others. Treat Mom to a Mother’s Day Nature Walk and then a refreshing glass of lemonade. This guided hike will introduce you to some of the wildflowers and birds found along the Indian Springs Metropark nature trails. Wear sturdy walking shoes and plan to be outdoors for about an hour on a gravel trail. Families can enjoy a nice glass of lemonade and a cookie together after the program. Dress for the weather, rain or shine. Please preregister, 248-625-7280. $3 Child / $5 Adult. Bring your bike and meet at the Nature Center for a relaxing ride to Huron Point. Along the way discover the history of the park and observe the wildlife that lives here. Age 10 and up. Please preregister, 586-463-4332. Discover why the Native Americans referred to this full moon as the “Flower Moon” while learning some facts, myths, and legends surrounding the moon. Please preregister, 734-782-3956. $4 Child / $6 Adult. Take a closer look at some of nature’s gems and discover some of the ways they make our lives better. Please preregister, 734-379-5020. $3 Child / $5 Adult. Bring your lawn chair and spend an evening listening and dancing away the night to some great music on the shores of Lake St. Clair. Listen to a bird story, make a bird craft, and spend the morning discovering the world of birds. Nature Story Time presents a new nature program every month geared towards children ages 4-7 and their families. Please preregister, 734-426-8211. $5 per child. Bring your water shoes and step into a tributary of the beautiful Huron River. Get a little wet as we search for the invertebrates that live in the water. Dress to get wet. A change of clothes and a towel are recommended. Ages 5–12. Please preregister at 734-426-8211. $3 per child. Bring your rollerblades and longboards to take a ride through the park. Start at the Nature Center, then head out to Huron Point. Along the way you search for wildlife and take a trip through time, discovering the history of the park. Ages 10 and up. Please pre-register 586-463-4332. $4. Not sure what to buy for Father’s Day? Forget the mall and bring the kids out to Kensington Metropark. Each child will get to craft a one-of-a-kind nature-themed gift dads are sure to love. No preregistration needed, just drop in to the Nature Center to get ready for dad’s special day. Fun for kids of all ages. $5 child. Paddle through the unique marsh aboard the 34-foot voyageur canoe, just like during the Michigan fur trade. Explore the marsh to hear and see the birds and frogs found there. Space is limited. Ages 7 and up. Please preregister, 586-463-4332. $5. The resident Bald Eagle pair is nesting this time of year. Hike to observe these magnificent birds on their nest and hopefully get a look at the eagles through a spotting scope. Bring binoculars if you have them. Ages 7 and older. Please preregister, 586-781-9113. $5. Indian Springs Metropark is home to several different species of dragonflies, and this program will focus on helping you recognize the difference between them. Start inside to learn a bit about the life cycle of a dragonfly before moving outside to see where they live. Dress for the weather. All ages. Please preregister, 248-625-7280. $3 child / $5 adult. Dads get a free ride today when they take their children on the hayride, as a thank you to those that work very hard and still have time to come with their kids for a fun afternoon at the farm. Dads FREE, standard hayride rates apply to others. Visit the farm to see the animals and enjoy a wagon ride. $5 / Dad’s FREE. Animal kingdom dads don’t all have the same jobs. Join us as we honor nature’s fathers and investigate their lifestyles. Just who might earn that title of Father of the Year? Please preregister, 734-379-5020. $3 child, $5 adult, Dads FREE. Travel back 300 years to the days of the fur trade on our 34-foot Voyageur canoe. Tour will guide you through the life of a Voyageur as you paddle the great canoe along the lakeshore. Learn history, enjoy seeing wildlife, and get a little exercise during this evening program. Program is weather dependent. Space is limited. Ages 7 and up. Please preregister, 586-781-9113. $5. Come learn about bat basics and debunk myths such as: Do bats drink blood? Will bats get stuck in your hair? Find out about how bats benefit humans in many meaningful ways and what you can do to help bats in your area during the presentation inside the Kensington Metropark Nature Center. Then head out with us for a short hike to see these amazing flying acrobats in action. Please dress for the weather. Ages 6 and older. Please preregister, 810-227-8917. $5. Learn why the sun is so important in our lives and in the lives of plants and animals around us. Participate in hands-on demonstrations and experiments to illuminate the sun’s amazing qualities. Covering everything from solar energy to our resident ectotherms, you’ll walk away with a new respect for the summer sunshine. Ages 7 and up. Please preregister, 248-625-7280. $3 child / $5 adult. Plan to arrive early for these popular fireworks events. A special event daily vehicle permit may be required after 5p. A Metroparks vehicle permit is required to enter any Metropark and is only $35 annually for regular admission, $21 annually for seniors or $10 daily. Free admission with annual permit. Visit www.metroparks.com for more info or call 734-697-9181. Enjoy a fun-filled weekend of farm-themed activities for the whole family. Tour the farm and view traditional demonstrations and games, listen to folk music, and visit with the food and craft vendors of our Festival Market. The Kensington Living History Village will be open, showcasing early pioneer skills. Make sure to take a horse-drawn hayride around the Farm’s wooded trails (Standard public hayride rates apply). A bicycle is a great way to explore various habitats in Hudson Mills Metropark. A leisurely peddle with stops to enjoy the scenery. Bring your own bike or rent one from us. Ages 12 and up. Please preregister, 734-426-8211. $8; Bike rental is $20. Hear the story of “The Very Hungry Caterpillar” by Eric Carle and learn about butterfly life cycles. Search for some caterpillars outside, go on a butterfly scavenger hunt, and make a butterfly to take home. The Little Critters Nature Hour presents a new nature program every month geared towards young children and their families. Ages 3-5. Please preregister, 810-227-8917. $5 Child. What lives beneath the surface of the pond? Use dip nets and some tubs to carefully catch and release some of the smallest pond creatures, and see what they can tell us about how healthy the pond is. Come dressed to be outdoors for this hands-on activity. Ages 5 and up. Please preregister, 248-625-7280. $3 Child/$5 Adult. Paddle through the unique marsh aboard a 34-foot voyageur canoe, like during the Michigan fur trade. Explore the marsh to hear and see the birds and frogs found there. Space is limited. Ages 7 and up. Please preregister, 586-463-4332. $5. The basics of navigation by map and compass. Then you can try out your new skills on Huron Meadows Metropark’s permanent orienteering course. Ages 10 and up. Bring a water bottle. Please preregister, 734-426-8211. $5. Every fairy needs a beautiful fairy house. Use your creativity to craft a unique fairy dwelling out of natural materials. This enchanted craft is perfect to put in your garden or on your front porch at home. Building materials will be provided. Ages 5 and up. Please preregister, 248-625-7280. $12 per house. These often misunderstood and overlooked creatures are some of the most unique and beautiful around. Learn a bit about them, then set up some lights and bait and see who pays a visit. Please preregister, 734-379-5020. $4 Child/$6 Adult. 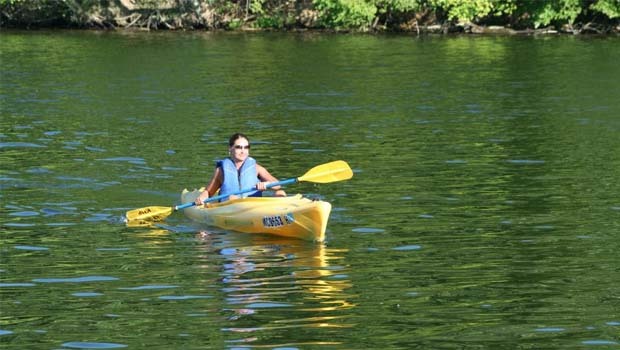 Bring your canoe or kayak for a guided tour of Kensington Metropark’s Kent Lake. Start out at the West Boat Launch and paddle out to visit the American lotus, North America’s largest wildflower. Then take in the islands to view a little of Kensington’s history, including the remnants that are still visible from the water of a former vacation spot. Spot a variety of wildlife, such as waterfowl, fish and possibly an eagle or two. A U.S. Coast Guard Approved Personal Flotation Device (PFD) is required and must be properly worn. Please preregister, 810 227-8917. $5. Summer Discovery Cruises offer anyone interested in exploring Lake Erie, the Detroit River and Lake St. Clair the opportunity to get out on the water for an educational experience. Cruisers can learn about many aspects of the lakes, from lighthouses, shipwrecks, bootleggers, history and culture of the region to fish, ecology, restoration, wind, waves and water — and much more, depending on the cruise theme. Reserve your spot at www.discoverycruises.org. Cost varies by cruise. Experience the sights and sounds of history during this Kensington Metropark tradition. Visit with historically-dressed reenactors portraying civilian and military life of the Colonial era. Be entertained with music and dramatizations, witness the firing of muskets and canons, and shop the booths of merchants where you may purchase hand crafted items made like they were in the 18th century. Fun for all ages. $2 / Kids Under 3 FREE. Always wanted to live the life of a traveling artist? Test the waters with a prairie-top hike to paint the blooming wildflowers and beautiful grasses of Indian Springs. Brushes, paint, and canvas will all be provided, but don’t forget your water and hiking boots. Ages 12 and up. Please preregister, 248-625-7280. $15. The War of 1812 is one of America’s lesser known conflicts. However, its impact on global history is tremendous. Look at the who, how, and investigate why we care. Please preregister, 734-379-5020. $3 Child/$5 Adult. Go in search of late summer wildflowers, and search for clues about the previous residents that made the hamlet of our park their home. Bring your own bike or rent one from the Metroparks. Ages 12 and up. Please preregister, 734-426-8211. $8 / Bike rental available for $20. Every fairy needs a beautiful fairy house. Use your creativity to craft a unique fairy dwelling out of natural materials. This enchanted craft is perfect to put in your garden or on your front porch at home. Building materials will be provided. Ages 10 and up. Please preregister, 248-625-7280. $3 Child/$5 Adult.